Bought two of these for a 6 year old getting new bunk beds - this looks fantastic on the white beds and there is a really pretty lilac/pink color that we painted the walls. The quilting is also very tight and pretty! 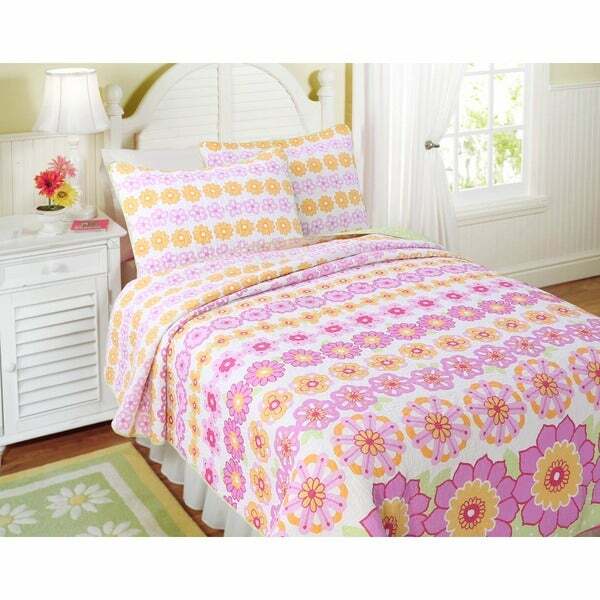 Dress up any room in bright color with this refreshing floral quilt set. Decorated with pink, green and yellow flowers, this machine washable quilt is created with soft cotton to bring both style and comfort to any bedroom decor. This quilt is perfect for summer...just the right weight and the colors really POP! We have it on our queen-sized bed...and absolutely love it! Washed upon receiving it, and it came out soft and bright. Do love these summery colors too! "Are there orange flowers on the bedding? Description says yellow but images look orange." There is orange and yellow - this bedspread is bright and colorful - very pretty and the quilting is really better than expected.